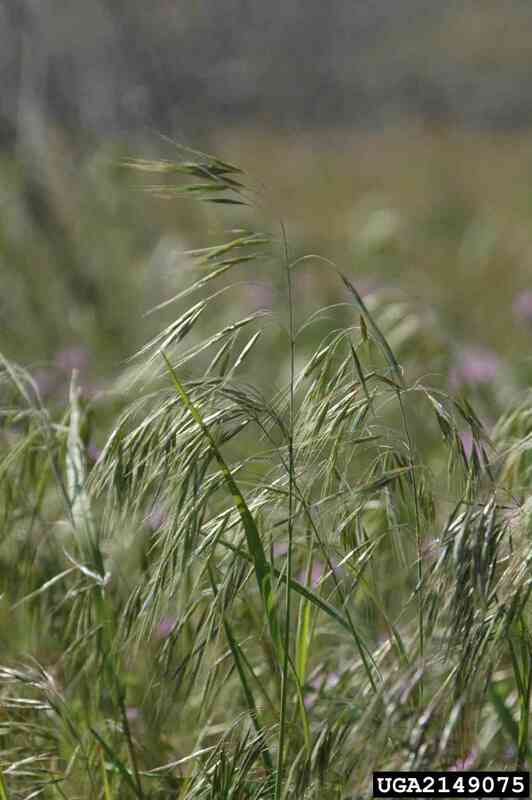 Cheatgrass is an aggressive winter annual grass that can grow up to 2 feet tall. Seeds germinate in the late winter or early spring. The leaves are flat, wide, and bristly at the base, giving the plant a downy appearance. Each plant can have multiple upright stemps. Cheatgrass flowers as an open panicle, each with five to eight florets tipped with a short awn. Plants mature to a wheat color by early summer. Grazing Objective: Intense flash grazing (i.e., grazing for short period) is recommended to remove biomass, decrease plant density, and suppress flowering. Growth Stage for Treatment: Graze cheatgrass plants as early as possible without harming desirable perennial plants, and repeat grazing to prevent seed production. Livestock readily consume cheatgrass when it is green and before it turns purple. A minimum of two treatments per year is recommended. Two or more years of grazing is required to significantly suppress cheatgrass populations. Potential Effectiveness: Surveys and literature agree that targeted grazing is an effective tool to control cheatgrass. Heavy repeated grazing for two or more years will reduce plant density, size, and seed production. Grazing must be closely monitored to avoid damage to desirable perennial plant species. Control of cheatgrass can be very effective when livestock are intensively managed and grazing occurs before plants turn purple. Grazing can also be used in conjunction with mechanical methods, herbicides, and controlled burning. Ganskopp, D. and D. Bohnert. 2001. Nutritional dynamics of 7 northern Great Basin grasses. Journal of Range Management 54:640-647. Knapp, P.A. 1996. Cheatgrass (Bromus tectorum L) dominance in the great basin desert – History, persistence, and influences to human activities. Global Environmental Change 6:37-52. Mosley, J.C. 1996. Prescribed sheep grazing to suppress cheatgrass: A review. Sheep and Goat Research Journal 12:74-80. Murray, R.B. 1971. Grazing capacity, sheep gains: Cheatgrass, bunchgrass ranges in southern Idaho. Journal of Range Management 24:407-410. Murray, R.B. and J.O. Klemmedson. 1968. Cheatgrass range in southern Idaho: Seasonal cattle gains and grazing capacities. Journal of Range Management 21:308-312. Stewart, G. and A.C. Hull. 1949. Cheatgrass (Bromus tectorum L) an ecologic intruder in southern Idaho. Ecology 30:58-74.